In the scientific context described above, it is easier to understand why the University of La Rochelle is interested in absolute gravimetry and why it contributed to the purchase of an FG-5 gravimetre in 2003 following a suggestion by the University of Montpellier. 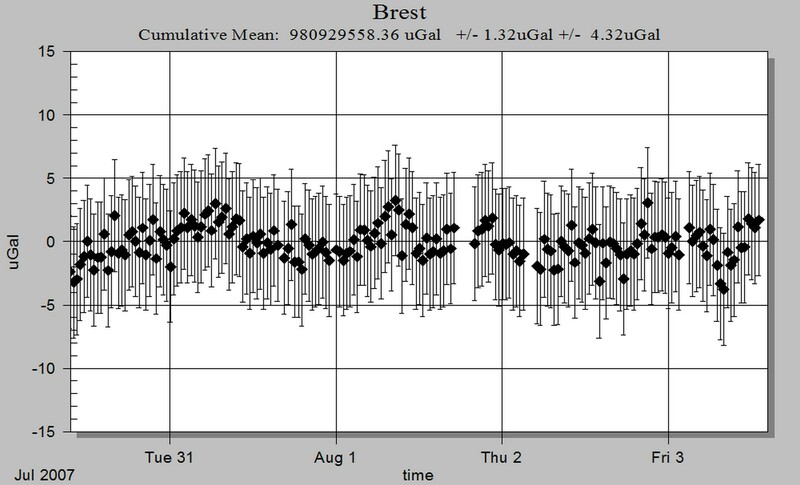 Thus, absolute gravimetry observations are now made with certain tide gauges, for example in Brest, La Rochelle and Marseille. The complementarity of this technique with GPS has been amply demonstrated (Zerbini et al. 2001). The FG5 gravimetre is based at the University of Montpellier (web site of the gravimetre). However, the programme of measurements, which are repeated annually with the main tide gauges, has had a slow start due to the fact that runnning the FG-5 requires financing, which is difficulty to obtain. The cooperation between SHOM and the Universities of La Rochelle and Montpellier is a garantee that the raw measurements will be processed using state of the art knowledge, the best models available, and the production of high quality results that can be interpreted and compared with the GPS and tide gauge data. The accuracy of the measurements required for monitoring the vertical movements of tide gauges must be between 1 and 2 microgals, or better if possible. To achieve this, the measurements are carried out in campaigns of a few days, repeated annually over long periods. The above image shows that these objectives have been reached. It shows measurements performed with the FG-5 gravimetre of the Universities of La Rochelle and Montpellier, in Brest, over five days, from 29th July to the 4th of August 2007 (Nicolas Le Moigne, University of Montpellier, personal communication ). Van Camp et al. (2005) estimates that using this measuring strategy , 15-25 years will be required to obtain vertical speed uncertainties equal to 0.5 mm/yr. Of course the results will depend on the type and the level of noise observed and, consequently, on the environment of the site.